My next sphere of work was Hull. The success which we enjoyed there surpassed anything that had hitherto fallen to my lot. The Salvation Army had two stations at Hull, one at Sculcotes and one which was called the Ice-House. I was present, along with General Booth and some leaders, at the opening of this second station. All the money except £1,000 had been promised. Mr. T.A. Denny, however, offered to give £200 if the people would raise the other £800. A deputation of local gentlemen told the General that if they could have Gipsy Smith as their Captain, they would raise the other £800 during his stay. By this time I had become known by the name of Gipsy Smith. At the beginning of the work I had been advertised as "Rodney Smith, the gipsy boy." The people talked about me as the Gipsy, and very soon that became my popular appellation. 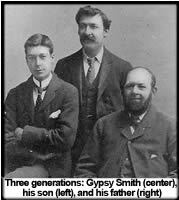 But in order to be quite distinct from my father and his two brothers who were always spoken of as "The Three Converted Gipsies," I resolved to call myself "Gipsy Smith." The General consented to the request of the local friends of the Army, and I took charge of the Ice-House. Never before had I seen such crowds and such wonderful results. It was quite a common thing for us to have gathered together a thousand people who had been converted at the services, and what is perhaps even more marvellous, an attendance of about fifteen hundred at the prayer-meeting at seven o'clock on Sunday morning. Very often the building was filled, and the street in which it stood, Cambridge Street, completely blocked. Many a time I have had to get to the platform over the seats, as the aisles were so crowded that nobody could walk up them. During the whole six months I spent in Hull we needed two policemen at every service to manage the crowds at the doors. Some conception of the magnitude of the work may be gained from the fact that the Ice-House and the other branch of the Mission, which was much smaller, sold every week 15,000 copies of The War Cry. One of the most notable of my converts at Hull was a woman who afterwards came to be known as "Happy Patty." Poor Patty had plunged deep into the sink of impurity, and for eighteen years had been living a life of the foulest sin. She came to the Ice-House and, to quote her own words, "stripped off her old filthy rags and jumped into the fountain filled with blood, drawn from Emmanuel's veins." She went home to her house rejoicing, but she had still a hard battle to fight. Her former life continually kept coming back and facing her, and she had to cut off her right arm and pluck out her right eye. The mistakes of her life had been many, the sins of her life more, but she became a child of God and a great force for good in Hull. Many weather-beaten seamen too were brought to God by my ministry in that old town. From Hull I went to Derby. I do not recall my work there with much satisfaction. It was a partial failure. I do not say that I had no success, because there was success, and great success, but I felt that I had not the success I ought to have had, and certainly not the success I longed for. There were palpable evidences of worldliness among the members of the local corps. I rebuked them They did not like my rebukes and they did not stand by me. I fought the battle practically single-handed, and although I had some fruit among outsiders and great sympathy from them, my labours were not nearly so happy or so fruitful as they had been at Hull. I became uneasy about my work, and I told the General, taking upon myself for once to dictate to him, that I should hold my farewell meeting on a certain date. He made no objection.